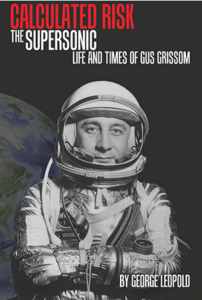 A new book, Calculated Risk: The Supersonic Life and Times of Gus Grissom, hits shelves next week. Its author is Reston resident George Leopold, a veteran technology writer who chronicles the early space explorer who lost his life in a launch pad fire in 1967. The book is published by Purdue University Press. Reston Now had a few questions for the first-time author. Reston Now: Give us a little background on your career as a writer and as a Restonian. How long have you lived here? Is this your first book? George Leopold: The American space program and the early pioneers that included Gus Grissom were to say the least inspiring. We did what we said we would do. The Apollo moon landings were among America’s greatest technological achievements. We had to go to the moon to fully appreciate all we have here on Earth. I can remember as a kid watching TV coverage of the Apollo 11 mission. After the dramatic landing and before the historic first moonwalk, NBC ran a two-minute spot that Sunday afternoon sponsored by the Gulf Oil Company about “a place called Reston, Virginia.” (The company had by then wrested control from Bob Simon). Growing up in Wisconsin, I could not have imagined that one day I would call Reston home. My family moved here in 1998, largely because my wife, Ellen Seefelt, works as a biologist at the U.S. Geological Survey. It was among the best moves we ever made. Needless to say, I was thrilled when my son attended Buzz Aldrin Elementary School. I have worked as a technology journalist and science writer since the mid-1980s. Calculated Risk: The Supersonic Life and Time of Gus Grissom is my first book. RN: What makes Gus Grissom an appealing book subject? GL: Gus Grissom is buried at Arlington National Cemetery, 20 miles as the crow flies from Reston. His death, along with his crewmates Edward White and Roger Chaffee, in a launch pad fire nearly 50 years ago was the defining moment of the Space Race. Their sacrifice shook NASA to its core, forced a thorough reassessment of the Apollo program that reasserted the absolute necessity for crew safety. Without the sacrifice of Grissom and his crew, it’s unlikely we would have made good on our declaration to reach the moon by the end of the 1960s. Grissom’s death at the age of 40 also meant his pivotal role in the Space Race is underappreciated. Unlike the other early astronauts, he never got the opportunity to publish his memoirs. Grissom faded from memory while others walked on the moon and returned as heroes. My aim is to explain Grissom’s essential role in the race to the moon, placing his life and career in the context of the history of human space exploration and the Cold War competition between the U.S. and the former Soviet Union. Finally, I have sought to dispel the myth that Grissom was the “hard luck” or “lost” astronaut. He was neither. He knew always where he was going and how he would get there. As my biography illustrates, a series of calculated risks and faulty engineering decisions made in the early 1960s played a far larger role in the astronauts’ untimely death. RN: It’s been nearly 50 years since the tragic accident in which Grissom was killed. Looking back, does Grissom have his rightful place in history other than being known for dying on the launch pad? GL: Gus Grissom should be recognized for much more than perishing in a preventable launch pad fire. He was the first human to fly twice in space, the first to actually maneuver his spaceship by firing thrusters to change his orbital path, a fundamental task if we were going to land humans on the moon. Grissom also was the first astronaut to be selected to fly the maiden flight of two new flying machines (Gemini 3 and Apollo 1) in the space of just two years. Within the test pilot fraternity of The Right Stuff, this was an exceptional honor not lost on his fellow astronauts. He also is credited with a central role in designing the two-man Gemini spacecraft widely referred to as the “Gus Mobile.” Mostly forgotten, Gemini was the essential bridge to Apollo and manned lunar landings. Then there were the many tedious but essential engineering tasks that Grissom performed without fanfare or credit. His contributions go far beyond Apollo 1. Had he lived, Grissom was in line to perhaps become the first man on the moon. Reston would therefore have an elementary school named for Virgil I. “Gus” Grissom. RN: How about the space program in general? Is the US where it is supposed to be now or have more recent accidents and budget cuts put a damper on things? What do you think the future holds? GL: In my view, NASA needs to refocus on again sending humans and machines beyond Earth orbit and let the nascent commercial space sector handle, for example, hauling crews and cargo to the International Space Station. If entrepreneurs like Elon Musk and Jeff Bezos want to pursue manned spaceflight, more power to them. But they must always remember that space is hard and there will be tragedies. Gus Grissom was a risk taker who understood that the longer he remained on the flight line, the greater the chances he could be killed. That is the hard lesson of Apollo 1 and the shuttle accidents that followed. RN: Astronauts used to be heroes. Do think they are heroes still? GL: We need heroes. Armstrong, Aldrin, Glenn, the others were all heroic. We’re he still alive, Gus Grissom would chafe at the label “hero.” Grissom did consider himself to be a “pioneer.” And because he was competing with the Russians to reach the moon first, he also was a Cold Warrior. Grissom was uninterested in personal prestige, but quickly grasped the underlying premise of the Space Race: A technical achievement like a manned lunar landing would confer enormous international prestige on the nation that did it first. One need only observe the throngs at the Smithsonian Air & Space Museum or the Udvar-Hazy annex near Reston to appreciate the significance of our space firsts. They would not have been possible without the unfailing efforts and sacrifice of Gus Grissom. Did ‘Fairfax Undergound’ Site Play Part in Firefighter Suicide?